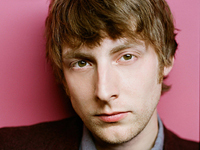 Few stories underscore the radical changes experienced by the post-millennial music industry than that of Eric Hutchinson. Originally nurtured and then abandoned by an established label started by a pop superstar, Hutchinson then got discovered by a much larger audience while unsigned, thanks to an online plug by a notorious Hollywood gossip. Born and raised in the Maryland suburbs of Washington, D.C., Hutchinson first began performing in public while attending Emerson College, a performing arts-oriented university located in downtown Boston. Between Emerson’s influential campus radio station, WERS, and the thriving local singer/songwriter scene, the guitarist and pianist found enough of an audience for his folk- and jazz-inflected brand of AAA pop (somewhere between Jeff Buckley and John Mayer) to move from Boston to Los Angeles and make a career of it. Hutchinson self-released his debut album, That Could’ve Gone Better, on his own Let’s Break label in summer 2003. The album gained the attention of Madonna‘s Warner Brothers-distributed label, Maverick Records, which had previously broken similar artists like Alanis Morissette and Michelle Branch. However, as Hutchinson was preparing his major-label debut, Maverick Records became embroiled in a lawsuit with its parent company, which effectively shut down the label; extricating himself from his Maverick contract took Hutchinson the better part of two years, but he returned to his own label in 2006 with the release of the wryly titled live EP Before I Sold Out.